Some AC Servo Drives Systems I have worked on. The machine you see above has one of the most sophisticated types of servo systems around. This system is called a Phase Locked Loop. Non technical people refer to them often as electronic or virtual gearboxes. The company I work for has many Bartelt type intermittent motion pouching machines. We had a job that required the volumetric fill of granular food products. 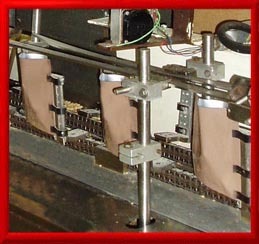 A contractor they used in the past had for sale these bolt on volumetric filler cup carousel assemblies that could be slaved to the pouching machine through a servo system so that each cup can follow each pouch on the track for accurate synchronized product drop from the carousel cup into the pouch below.. This was great. No major machining was required, just a few bolts and connect a few wires and you are done. My company bought 2 systems and the contractor came in with their installation crews to add these subsystems on. One of them worked perfectly, but the other one would drift out of synchronization after about an hour or so of running. The contractor claimed the ratio was slightly off on the main gear box and they the needed to get a new one. They vowed to return with a new one and my boss signed a check to pay for the two systems. Guess what? The contractor never came back, because they went out of business. So now the job fell to me to figure out how the system worked and fix it. I tried to find the designer of the original system but to no avail they were gone. Next I did a forensic analysis of the system. That is I looked at all the brands and models of the components to find all the brand names and model numbers and get the specification and data sheets on each component to see if I could reverse engineer the logic of what this thing was doing from the available data. After my analysis I decided to zero in on the AC drive. This was the unit programmed to work as a servo in phase locked loop mode. The drive was made by Emerson Control Techniques and what a lucky break that was. I called up their tech support department and found people who would work with me for many hours over the phone trying to get to the bottom of what was going on here. This companies drive prices are high compared to most of their competitors, but the quality of there products are excellent and their after the sale tech support is beyond excellent. Without their generous help I would have never been able to figure out what this system was doing. There were books or service manuals supplied with these machines when we got them so I was really stuck here. The key piece of data here was for me to use the Control Techniques software to extract the servo program from the drive and print it out to see how it works. From there I could see what was going on. The system used 2 encoders for information. The reference encoder was geared to the main shaft of the machine. The feedback encoder was mounted on the carousel shaft itself. Both encoder pulses feed into the AC drive through special amplifiers. The program in the drive compared the reference signal to the feedback signal which came back through a divider circuit to yield a virtual gear reduction. If the encoder signal from the carousel shifted out of phase with the reference signal an error signal was generated causing the carousel to speed up or slow down so as to remain in synch with the pouching machine. It's a very simple system, but unless you really know your way around electronics and software you are a dead man walking on a system like this one. Now that I had the system figured out I programmed a PLC with a long time base to count the pulses from the pouches and the cups to see how far out of synch they would go after 2 hours. This counter became my set of eyes and I tweaked the ratios in drive program until the cups and pouches were perfectly synchronized. Computron strikes again and another debacle gets solved. There is a slide show with some details you can view on this. Click the link on the left.